Our company is also engaged in manufacturing and supplying Hydraulic Lifts and Elevators. We offer these products which are manufactured with very high quality Steel and iron which are procured from very reliable vendors of the markets. We have been counted amongst the most trusted name in this domain, involved in offering a wide range of Hydraulic Lift Platform to our clients. Easy to install these products are known for their safe use. the products we offer find their applications in various industries.As per the demand of our clients, we are offering this product in different ranges and specifications. Innovation is our forte and we strive to design and develop a precision engineered range of Hydraulic Scissor Lifts. 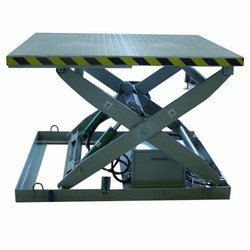 This range of hydraulic lift platform/ scissor lifts works on the motor mechanism for hydraulic-lifts. These products work on the elevator valves, submersible motors and screw pumps.